Easyslots.com players, join forces with Mr Lake and his comrades to go on a mission to bring down Mr Romano and his evil empire. His admiration of illegal hunting doesn’t sit well with Mr Lake’s five animal companions and is evident throughout this fantastic slot. This ELK Studios title is a 5-reel slot and has up to 178 ways to win. Although ELK Studios focus on sophisticated designs and state-of-the-art graphics, they’ve crafted a game that offers lucrative bonus features. Prepare yourself for late-night heist at Mr Romano’s tower building. All top slot games site available here on Easy Slots! The opening game credits and relaxing lounge-like background music are surprisingly soothing despite the fast-flowing game play that will ensue. During your real money spins, you’ll soon realise that some symbols pay differently to others. The lowest paying symbols are the medical kits and diamond bowls. The medium to high paying symbols that will take your cash prizes to that next level are Mr Lake’s five companions, such as: Elephant, Alligator, Monkey, Parrot and Goldfish. * WILD RESPINS – Hit 2 SCATTERS and the Wild RESPINS will trigger. The scatters that you hit will turn WILD and for each respin, those select reels will move one position downwards. * THE HEIST BONUS GAME – Hit 3 SCATTERS and The Heist BONUS Game will trigger. You’ll be credited 10 free spins and if you hit a key symbol during the feature, you’ll receive 1 extra free spin. * STICKY WILD – These WILDS will stay on the reels for the remaining free spins. * CLIMBING WILD – These WILDS move one position upwards for each spin. * WALKING WILD – These WILDS move one position to the right for each spin. If two WILD symbols land in the same position, they will combine to create a multiplier for that spin. Read more about casino by mobile and start spinning today! It’s pretty much a given that ELK Studios creations have incredibly in-depth storylines, but Lakes Five also delivers on the gameplay aspect. 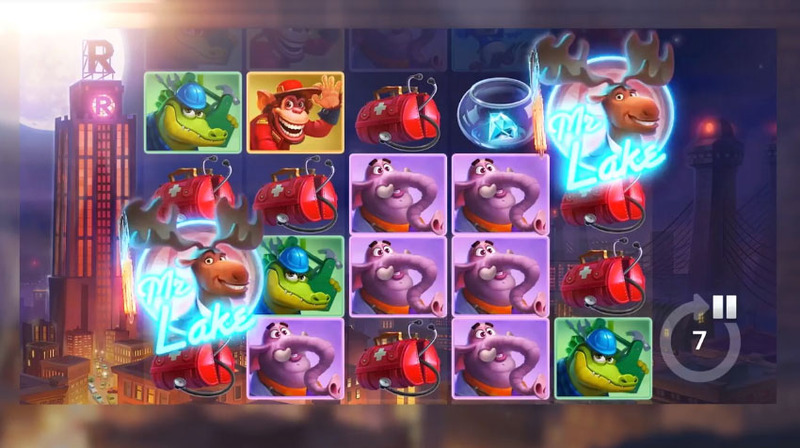 The Heist Bonus Game is the main attraction of the game and has some additional features built into it. As a mobile first design, you can enjoy Lakes Five on your mobile or desktop with no complications. Absorb the variance and stick around for the generosity of the bonus feature. If you enjoyed Lakes Five why not try another online slot, visit here.